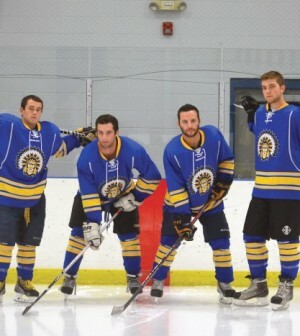 In 2012, a group of Quinnipiac students established a club hockey team unaffiliated with Quinnipiac University. Known as the Brave Hockey Club, the team enters its third season in hopes of winning as many games as possible. However, the team’s toughest task doesn’t take place in the rink. The Braves biggest battle is dealing with being unaffiliated with the university. Club president Sean Simons talked about the perils of being unaffiliated, including the time he puts into scheduling games and practices and raising money for the team each year. The Braves compete in the American Collegiate Hockey Association, which is the largest club hockey league in the country. The team cannot become an official member of the league, though, until it is officially recognized by Quinnipiac. That means the Braves don’t get to participate in postseason play, either. 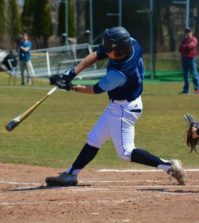 “The other teams go to playoffs, and we just stop,” junior Collin Fay said. Simons added that the Braves season opener against Fairfield was actually the tryout for the Fairfield team. Simons says he called more than 50 schools during the offseason to schedule games, but only heard back from 15 coaches. The ACHA has over 300 schools, but Simons added that most of the D1 teams won’t play a club team. Simons added, though, that the team was able to schedule some big games, such as the matchup against Boston College. The fan support is also an issue the Braves face. “Some of the other school’s fan base is much larger because the team is affiliated with the school,” Simmons said. Fay, however, sees the team’s fan support rising from year to year. On the ice, the club looks to improve on its 7-7 record from last season. The Braves have added 10 new players to this years’ 25-man roster, after a two-day tryout determined who would make the team. “There were kids from last year that we knew we were going to keep so there’s limited spots open, so there was a pretty big battle for spots,” Jackson said. Fay added that there was a huge increase in skaters that tried out for this year’s team. The team can only take 25 players because it is registered with USA Hockey. Simons and Jackson both agreed that one player, sophomore forward Cam Curley, stands out among the rest of the newcomers so far. Curley scored three goals and had an assist in his first game with the Braves. Simons said he would not trade the experience for anything. And for Jackson, the Braves provided a way to meet new people immediately. Fay said if the team could become affiliated with the university it would allow the team to build more of a competitive atmosphere. And since the club’s founders are still apart of the program, becoming affiliated would be even more meaningful. “We’re the ones who started this so it would be cool to pass it down and see if it works out for us and we’re hoping it does,” Jackson said. Despite the numerous obstacles that stand in the way of the Brave Hockey Club, the team stays optimistic for the season ahead both on and off the ice, all hopefully leading this club to affiliation and their rightful spot in the ACHA. All along, their goal to become affiliated with Quinnipiac University remains up in the air.